This video shows the build of a river pump that you can use to pump water from a nearby river or creek anywhere you want. It works by harnessing the flow of the river and creating air pressure to push the water further.It pushes water out from the river and up through your hose system, which you can direct where needed. To use a river pump, all you need is a nearby river or creek that has flowing water and a location that is deep enough to support your river pump. As long as you have that and the necessary supplies, you are good to go. 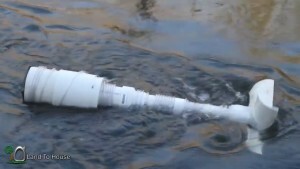 The materials you need for this project are River Or Creek – In order to use river pump, you need a nearby river or creek with flowing water,2”- 3” Reducer,3”- 4” Reducer,4” – 6” Reducer – These reducers will be used to connect the PVC tubing together,40’ of 3/8” tubing – Air pressure will build into the tubing, pushing the water out from the river,Hose Adapter – Use a swivel adapter to allow the fins to spin.